Meet Haminal, the wide-eyed furry animal who fits perfectly in a sharp-edged can and comes topped with a pineapple slice. This is the creation of Crystal Chesney-Thompson, who has been selling these strangely cute ham-inspired creatures at Comic-Con in San Diego, California, for three years. She came up with the idea in 2004, when she and others in her martial arts group were roasting canned ham on a campfire. 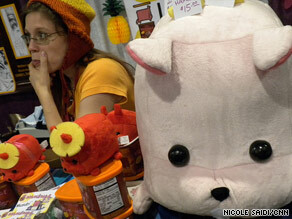 Today, she's selling pig-like pink "canned" Haminals, as well as red "deviled" Haminals, just for Comic-Con. Next year, she plans to introduce a tuna fish. No, this is not Chesney-Thompson's only job. She will be directing four episodes of "Futurama" this season. Aimee Major Steinberger, sitting on the same row as Chesney-Thompson in the Exhibit Hall, is an assistant director for "Futurama," but she's also promoting her side project: a graphic novel for teenagers called "Japan Ai." It's based on her own trip to Japan, she said. When it comes to these side projects, neither of these "Futurama" collaborators reported a negative impact from the economic downturn. Chesney-Thompson has been seeing good sales via the Internet, and Steinberger's business has been doing better this year than last. "People need an escape of buying artwork or entertainment," Steinberger said. So what's in store for fans in "Futurama’s" much-anticipated revival? There will be more "what if?" episodes, and the show will explore interesting relationships between characters that have not been explored before, Chesney-Thompson said, echoing the "Futurama" panel from earlier in the Con. The show will also explore the backgrounds of Scruffy and Dr. Zoidberg, she said. "Futurama: I LOVE that show."